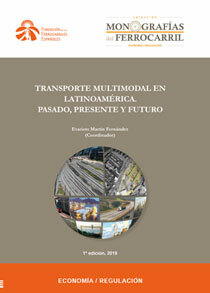 This monograph summarises the main railway projects that were developed, are being developed or are planned to be developed in 17 Latin American countries; and it provides up-to-date data on multimodal transport in all of them. The preparation of this document was coordinated by the representative of the Latin American Railway Association (ALAF) in Spain, Evaristo Martín Fernández, who at present carries out his professional activity in Renfe’s Strategy Department. This document comprises 17 chapters, each of them belonging to one country, namely Argentina, Bolivia, Brazil, Chile, Colombia, Costa Rica, Cuba, Ecuador, El Salvador, Guatemala, Honduras, Mexico, Nicaragua, Panama, Paraguay, Peru and Venezuela. The contributors who provided the information of the different countries took part in the course on Efficient Intermodal Logistics in the Integrated Rail-port Transport, which was first given by the CEDDET Foundation and Renfe in 2015, with a second edition in 2016; and financed by the Spanish Agency for International Development Cooperation (AECID).